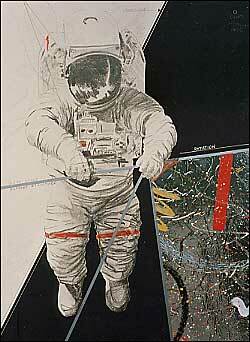 In the past century a new and highly diverse genre of art has emerged - Space Art. Artists have been at the forefront of space exploration since its very beginning. Their works of imagination have stimulated and catalyzed a new human endeavor. Works of art and literature about space have both anticipated and stimulated space development while exploring destinations and technological concepts that were often too dangerous, too distant or too advanced for the science and technology of the moment. Artists have worked closely with space scientists and engineers to help them to visualize and develop their scientific and technological concepts making the dream of space exploration a reality. Science Fiction literature with a space theme combined with cinematography has since become one of the most popular and financially successful artforms of all time. As such it stimulates the public's fascination with space exploration and likewise has a positive influence on maintaining the public's support for further space development. Today, a new breed of contemporary artists have initiated projects to explore outer space on their own terms by realizing their art beyond Earth or with their own bodies in weightlessness. The goal of "Spacearts - the Space Art Database" is to document this important and exciting art form and to make it be publicly accessible on this website. Leonardo/OLATS - the French branch of Leonardo/Isast (the International Society for the Arts, Science and Technology) and the Foundation - a non-profit cultural and astronautical organization based in Switzerland have embarked on an ambitious project to comprehensively document this vast and new genre of space art. Spacearts is an online database providing information about the arts related to outer space from the middle of the 19th century until the present. Spacearts is a comprehensive reference that focuses on the artists engaged with the themes of outer space exploration and space development and documents their significant contributions. Spacearts is international in scope and multilingual in practice with English, French and German language versions developed simultaneously. Space Art in many cases has anticipated, through the visions and ideas it incorporates, many technological and space developments.